With the STIHL RT 6127 ZL ride-on mower, you can work with power and precision on extensive lawns. Even under difficult working conditions, the driving comfort and controls of the lawn tractor ensure that mowing remains time-saving and effortless for you. The large cutting width, the synchronous mowing deck and the intuitive cutting height adjustment via the ergonomically designed control panel ensure a consistent cutting quality. Thanks to the high-contrast LCD display, you have all the important ride-on mower functions under control as you mow your lawn strip-by-strip on the driver's seat. With the cruise control function, you can continue driving in a controlled and fatigue-free manner. All the other controls can also be comfortably operated from the control panel. The mowing deck can be activated or deactivated via the electromagnetic blade clutch. The catching management system optimises gathering of the grass blades over the entire cutting width of the machine. With the single-pedal self-propulsion, you can efficiently change the driving direction of the lawn tractor from forward to reverse gear for even more precise manoeuvring. The practical bow handle for effortless emptying the 350-litre grass catcher box can be operated effortlessly from the driver's seat. Cleaning the grass catcher box in the "dumper" design is equally simple as it is made from plastic. With the Stihl RT 6127 ZL garden tractor, even large lawns can be mowed effortlessly. Sit down and start up the powerful Briggs and Stratton 23HP twin cylinder engine with ease. The LCD display on the control panel ensures that everything is under control at all times, for example the LCD indicator informs you when it is time to empty the grass catcher box. All the other functions such as cutting height adjustment, blade clutch or grass catcher box emptying can be performed from the practical yet incredibly comfortable driver's seat. This function can be conveniently activated at the press of a button. You can therefore control the speed of your STIHL ride-on mower automatically and continue to work tirelessly. The large turf tyres of the STIHL ride-on mower help to protect the lawn. Thanks to their rounded tyre design, they reduce the formation of driving tracks. The integral trailer hitch enables easy mounting of attachments such as the convenient PICK UP 300 tilting trailer, which can also be used as a wheel barrow. Thanks to the high-contrast LCD display, you can easily see all the important ride-on mower functions; including operating hours, battery voltage, grass catcher box filling level and emptying time, fuel tank filling level, oil pressure monitoring, mowing deck activation. The lever to adjust the deck cutting height is located directly next to the driver's seat. It enables individual adjustment of the cutting height in up to eight steps. The robust frame construction gives the mower a high level of stability and driving comfort. The STIHL ride-on mowers compact design is great for using attachments such as the AGW 098 garden roller or PICK 300 tilting trailer. The synchronous mowing deck provides consistent cutting quality and optimum grass flow through to the catcher box. This is made possible by the synchronised rotation of the blades, which are offset by 90°. The most comfortable seat position can be set without the use of tools. This allows individual adjustment of the driver's seat to almost any body size. The low step on the STIHL ride-on mowers provides ample legroom and allows for comfortable access to the seat. The catching system guides the grass blades across the entire working width of the mowing deck. It helps to guide the grass towards the mowing blades for a more efficient cut. The polymer grass catcher box can be emptied effortlessly from the driver’s seat simply using the curved shaped handle. The "dumper" design ensures optimum filling and residual-free emptying of the grass catcher box. Cleaning the catcher box is also easy. With the STIHL single pedal drive, the direction of travel can be conveniently switched between forward and reverse gear using a hand lever for quick manoeuvring. The pressure-sensitive pedal allows for precise control of the speed between top speed and standstill. The separate brake pedal ensures immediate stopping. The mowing deck can be easily engaged and disengaged by a switch situated on the control panel. With the mulch insert, the STIHL ride-on mowers can be converted into mulching mowers. The grass catcher box is simply removed and the mulch insert pushed into the grass catcher chute. This allows the grass to be shredded into fine particles inside the closed housing before they fall back into the turf, returning vital nutrients and moisture to the soil. Through this natural form of fertilising, there is no need to dispose of the grass. Viking were founded in 1981 in Kufstein, Austria and have since developed into one of the leading manufacturers of high quality garden power tools. Soon after the company opening, a few years later in 1984 Viking were already beginning the development of their own line of lawn mowers. By 1992 Viking became incorporated into the Stihl Group, the global market leader for chain saws and renowned outdoor power tool company. Viking are proud to uphold the Stihl family credentials. and the Stihl and Viking alliance provides well designed and ultra reliable garden care products as well as an extensive network of specialist dealers. In 2001 Viking opened a new Competence Centre to accommodate for the company’s rapid growth. In 2007 they expanded even more and constructed a new Viking Headquarters for the company to develop even more effectively in the future. The first ever Viking roller mowers were produced in 2008 specifically to meet the needs of British gardeners. The Viking MB 545 VR rotary roller mower received the Best New Product Award from the British Hardware Federation the very next year. Soon after this, Viking took off even more and produced a new and unique range of lawn tractors. Today, Vikings motto is “Love Your Lawn”. 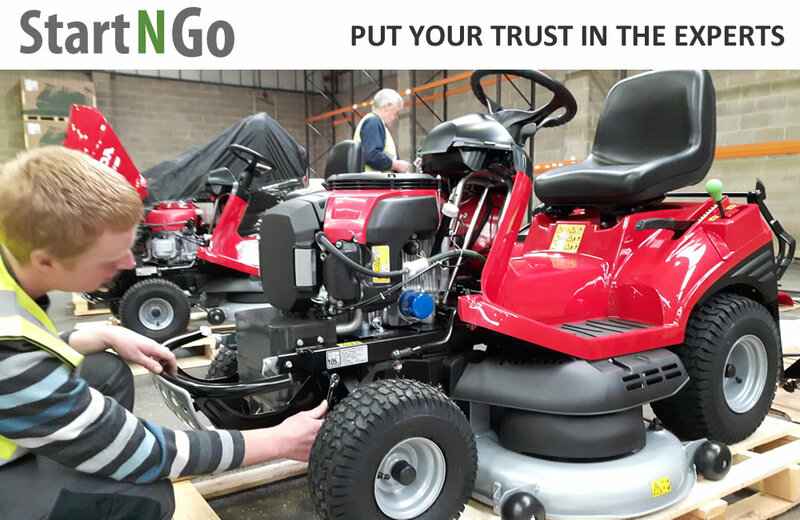 They are a premium brand which design, develop, manufacture and sell a very large range of mowers, ride ons, scarifiers, shredders and tillers. Viking are constantly looking for ways to develop their high quality machines are always working towards meeting the needs of their customers.